According to Spookshow, it's a second generation Rapido, verified by the markings on the chassis, and it hails from somewhere between 1967 and 72, although he doesn't mention the DRGW paint scheme in the offerings. It's actually a pretty smooth runner, given its age. (According the newspaper it was wrapped in, it hadn't turned a wheel since 1979... it took some cleaning and lube to fire it up, but it's been running around a loop this afternoon. Anyway, that, combined with the selection of vintage rolling stock, and a selection of old school structure kits (you know, the ones that Walther's charged $45 for but the tooling was paid for decades ago... ) has me thinking about doing a 2'x4' loop, complete with snap switches, code 80 track, and maybe even a styrofoam mountain. What do you think? I think it's a great way to take a step back to one's childhood, and also offer homage to the products that laid the groundwork for what we all enjoy today. I took a stab at exactly the same thing--I just never had the time to finish it. 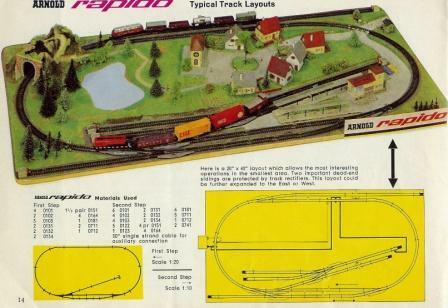 That Rio Grande F-unit was part of the Revell/Rapido 'Microtrains' line-up that Arnold once produced for Revell. Expected to see Yoda somewhere in this thread. And I thought of a movie from the '80s. 4 cars a caboose and an oval of track with two switches. Got it Christmas of 1968 and I remember it being in the Sears Christmas wish book!!! one of the engines and some of the cars. 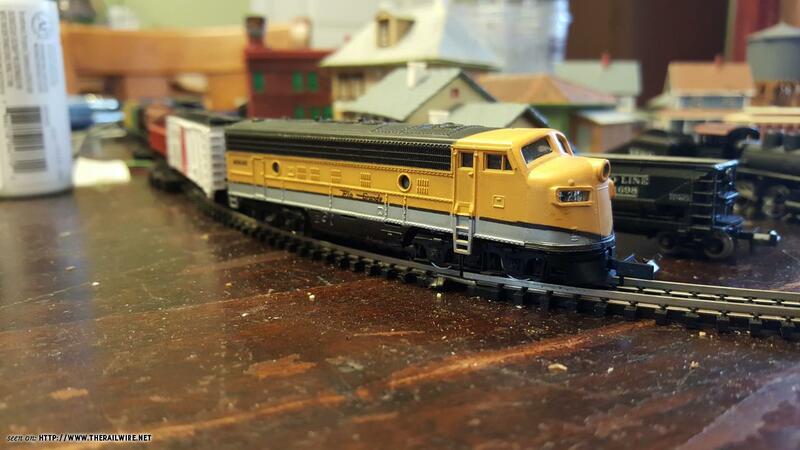 How many of you guys have at least one car/loco from the first RR set you originally bought at least 30 years ago you still run regularly on your layout? From 40 years ago? 50 years? My first N scale trains were an Atlas set in 1968. 0-8-0, four cars and a caboose, track, pack. One car was a Frontier chemical single-dome tank car. Now painted black and upgraded with the old Kadee trucks, it still rolls around my trackage now behind DCC locos with sound. The only survivor, yet I have no particular reason why I kept it. I remember every other car from that set, too. My first was a Lone Star 000 set, for Christmas, 1967. The only remaining active piece, although rebuilt several times, is the tank car. It's now in regular service on my narrow gauge, with MT trucks and couplers, and extra detailing. Size-wise it fits very nicely, and looks right at home with former Colorado NG tank cars. One flatcar was kitbashed years ago into a semi trailer, and somehow was missed by the burglars, who got most of my vehicles. Strange burglars - they left the visible trains, and went for the vehicles on the top shelf. In any case, I have two pieces on the layout regularly. The caboose was repainted for NP, and fitted with KD trucks and couplers, but isn't in regular service. Heck, I still have ALL of my N scale/OOO trains (I also have the American Flyer stuff and HO stuff from my family) I have ever had, the earliest being Treble-O-Lectric and then the first Atlas N scale. While my main layout has been laid up in my previous residence (due to family situations), I have a Treble-O-Lectric and an Arnold Rapido layout here on which to run trains. I have also bought several Rapido locomotives and track recently, the one brand I really didn't explore in the early days. I love the old N scale. I have also gone nuts trying to have a complete collection of Treble-O-Lectric (Just a few things to get, the rare stuff, of course). And, actually Lee, that little old Rapido FP9 looks pretty dang good, even up close. I have about a dozen sets on hand. Let's talk. We can probably work something out. I still have the first two HO cars that I ever bought. I bought them in the late 1960s. They are an Athearn BlueBox fifty foot automobile car painted in Q "Chinese Red" and a caboose painted for SP (it is the standard ATSF steel caboose). They still have their X2F couplers. I do not run HO any more, but I still have them. I have one "Swift Premium" refrigerator left from the first LL HO set that I bought in the early 1970s and the body and undercarriage of the NE caboose that was in the set. Eventually, I made a work caboose out of it by cutting down the undercarriage, flipping it over and affixing it to a flat car. In addition, I still have the power pack and it still works. The LL sticker over the Varney printing on it is long gone, though. You must jiggle the directional switch to get contact. The only thing that I still have from the first N scale set that I bought is the shell of a Mehano FA-2 that actually was not in the set. There was an 0-6-0T that fell apart as soon as I took it out of the box. LL offered me the FA-2 as a replacement. I do not k now what happened to the other cars, the power supply or the track, although I may have a few pieces of track left, it is just that I can not identify it. I no longer even have the better quality stuff that I bought early in my return to this hobby. My first purchase of something decent was an Atlas/Kato Penn RS-11. I bought some Atlas freight cars and a caboose as well as two B-mann shorty passenger cars. I traded away the locomotive, cut up one of the passenger cars for a bash, sold the other one, sold the caboose and one of the freight cars. I do still have the CNJ forty foot Atlas box car. I do not have the RoCo E-7 chassis with RR E-8 shells any more or any of the "powder blue" RR B&O passenger cars. I sold all of them. The oldest purchase that I still have, other than some freight cars, would be a RR USRA heavy Pacific that is a factory paint and letter in black for B&O. Other than the freight cars, I stopped running much of the older stuff, as better stuff had superseded it. I sold most of the older stuff. Who do you need off'd?